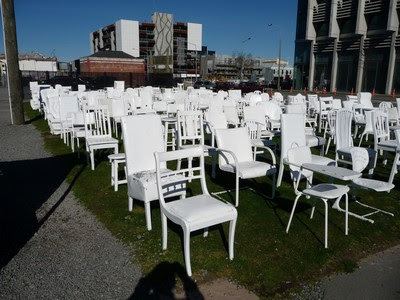 The chairs appeared on February 22, 2012, which was the first anniversary of the devastating Christchurch earthquake. Initially 185 white chairs were placed on the site of a demolished Church for just one week. People wanted them to stay around so they were moved to the site of another demolished church. they won't be able to stay here either but for now they are a major tourist attraction in the city. There is a poignancy about them. I took this photo in August 2017.